Find the thrust exprienced by a flat keel plate 10m x 2m when the draft is 8m in SW.
= 8.2 x 20 =164 t .
A box-shaped vessel 150m x20m x 12m is floating in a dock of RD 1.010 at an even keel draft of 10m. Find the total water pressure experienced by the hull. 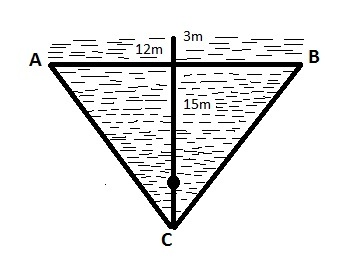 A submarine has a surface area of 650m2 and can with stand a total water pressure of 1332500 t . Find at what approximate depth in SW she would collapse. Hence , Depth = 2000m. A rectangular lock gate 40m wide and 20m high has water of RD 1.010 12m deep on one sideand water of RD 1.020 11m deep on the other. Find the resultant thrust experienced and direction in which it acts. A rectangular lock gate 36m wide and 20m high has FW on one side to a depth of 16m. Find what depth of SW on the other side will equalize the thrust. Let ‘X’ depth of salt water on other side will equalize the thrust . 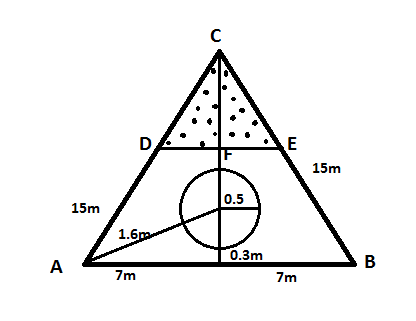 A collision bulkhead is triangular in shape. Its maximum breadth is 12m and its high 15m. 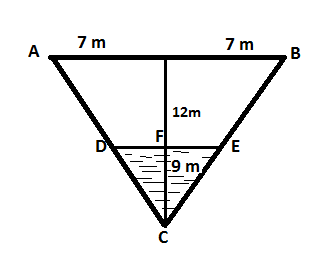 Find the thrust experienced by it if the fore peak tank is pressed up to a head of 3m of SW.
A collision bulkhead is triangular shaped, having a breadth of 14m at the tank top and a height of 12m. As a result of a collision, the forepeak tank gets ruptured and SW enters the tank to a sounding of 9m. Calculate the thrust on the bulkhead. Since, Height divide AB equally into two parts. A tank has a triangular bulkhead, apex upwards. Its base is 14m and its sides, 15m each. It has a circular inspection hole of radius 0.5m the centre of a manhole 0.8m above the base and 1.6 from one corner. Find the thrust on the manhole cover when the tank contain oil of RD 0.95 to a sounding of 10m. (Assume π to be 3.1416). 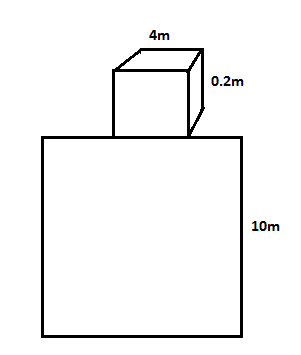 A rectangular deep tank is 22m x 20m x10m. Above the crown of the tank is a rectangular trunkway 0.2m high, 5m long and 4m wide. Find the thrust on the tank lid when the tank is pressed up with SW to a head of 2.64m above the crown of the tank . If this trunkway would have been placed inside the tank then the depth will be (10m + 2.64m – 0.2/2m ). A double bottom tank measures 25m x20m x 2m. 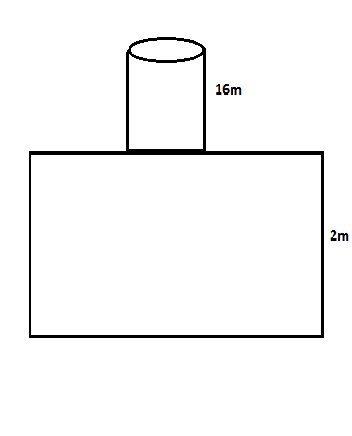 Find the thrust on the tank top when pressed upto a head 16m of SW. Also find the resultant thrust on the tank bottom, and the direction that it acts, if the ship’s draft in SW is 10m. What are Errors Of GPS System?